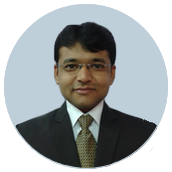 In 2013 Ankur joined PlanTools as a Team Lead and Sr. Developer for our off-shore development team. Ankur is responsible for analyzing project business requirements, project estimation, client meetings and communication between internal and external teams. Ankur holds a Bachelors of Engineering degree in Computer Science, with an emphasis in Microsoft .NET Technologies. In addition to his passion in IT, Ankur loves spending his time speaking at universities, reading, meditating and spending time with family.